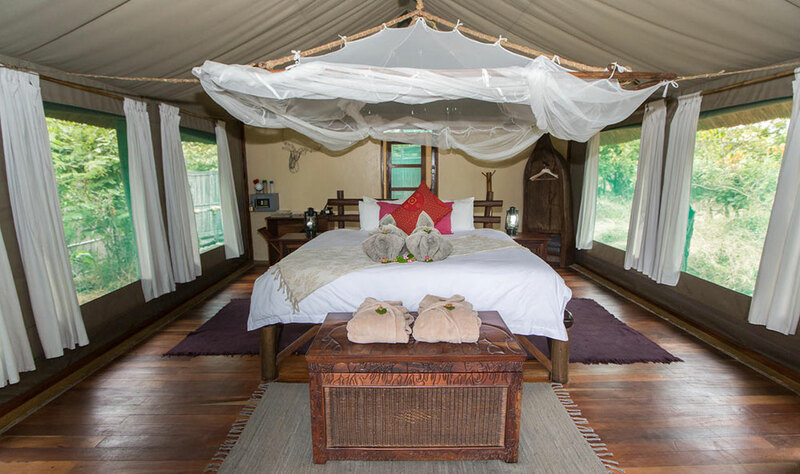 Mvuu Wilderness lodge consists of eight spacious tents with ensuite bathrooms for a maximum of sixteen people. Bonuses are the private viewing platforms, provided for each tent, that face the lagoon. There is also a unique honeymoon suite available for adventurous newly-weds. Mvuu Camp is a more rustic experience for couples or families. 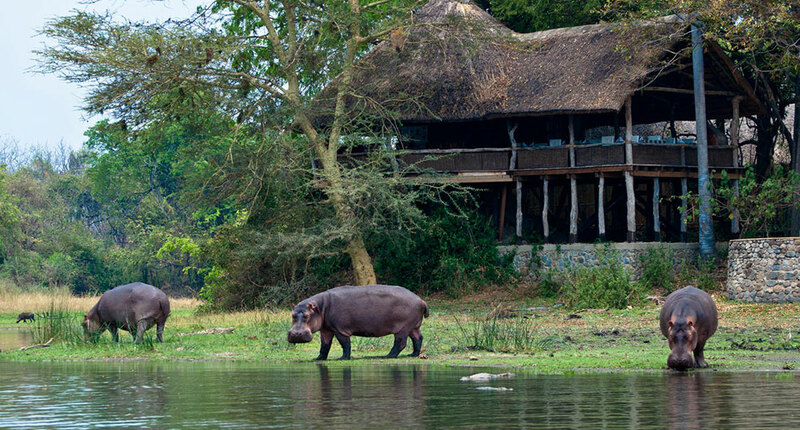 Situated on the banks of the Shire River, Mvuu, which means hippopotamus or river horse in Tonga, got its name for a straightforward reason – hippos are everywhere. The lodge’s main lounge is located high above the water of the lagoon, where the animals come to congregate, meaning you will be joined by these joyous dinner companions most every night of your stay. Picture yourself sitting above a lagoon sipping your favorite sundowner while listening to the deep laughter of hippos splashing around in the water below. As the sun sets, a backdrop of indigenous fever trees light up as if on fire, and the air is saturated with a cacophony of insect and bird noises. Memorable experiences such as this are easily come by when staying at Mvuu Wilderness Lodge and Camp in Liwonde National Park. 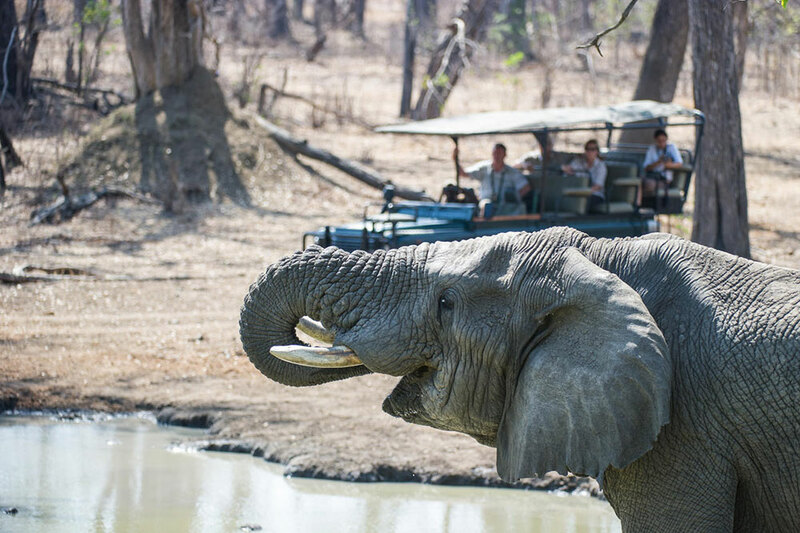 Wilderness Safaris, the company that runs the lodge and camp, have worked long and hard to conserve the park’s wildlife and landscape, and the benefits have paid off. Liwonde National Park now has the most prolific wildlife in the country and is the most popular safari destination in Malawi. Mvuu Lodge, first opened to visitors in 1995, provides an exclusive and intimate accommodation experience in Liwonde National Park. It is situated close to the lagoon in the north of the park and blends smoothly into the dense surrounding vegetation. 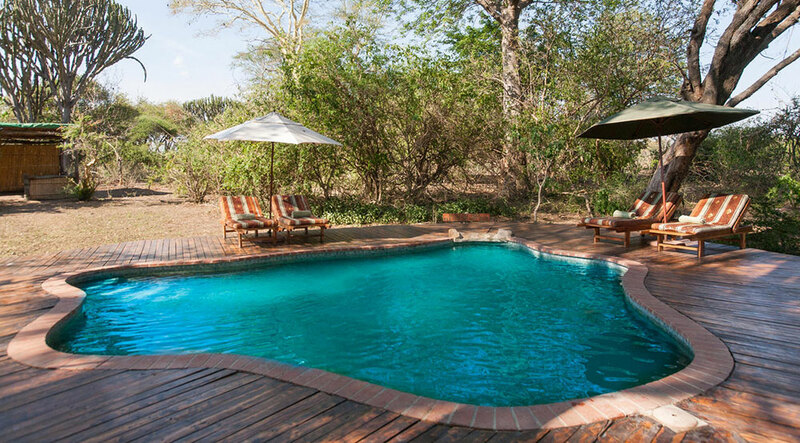 This makes it the perfect location for viewing the wealth of animal and bird life that gravitate towards the water and means that instead of going out on safari searching for game, the game will more likely come to you. Other facilities at the lodge are the main dining room, pub, and lounge that sit raised under a thatch roof overlooking the Shire River, a wildlife library, a hide that overlooks the river, which is perfect for bird watching enthusiasts, and laundry facilities. Also, the main dining room is connected to the rest of the lodge by wooden walkways that lead onto a pool surrounded by a deck of Mulanje Cedar, a tree native to Mount Mulanje, which boast the highest peak in Malawi. Meals can either be taken in the dining room or out on this cedar deck. It is important to note that while children over eight are welcomed at the Wilderness Lodge between November and June, between July and October only children over the age of 12 can stay at the lodge. Guests with children are advised to book accommodation at the Wilderness Camp if they are traveling from July onwards, or have children younger than eight years old. The Wilderness Camp is located a short distance downstream from the lodge, which are separated by a short distance of bushland. It is the best onsite accommodation option for tourists traveling in large groups, for those with children, or guests on more of a budget. First restored for visitors in 1994, the camp accommodates 48 guests in a mixture of stone and thatched en-suite chalets or tented rooms that share toilet facilities. 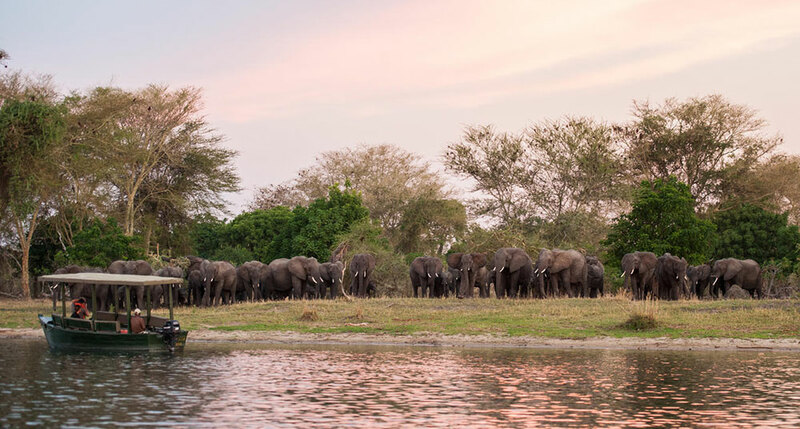 In addition to sleeping accommodation, the camp also has a thatched dining and lounge area that has a great view of the river and therefore the multitude of animals that come down to drink, bathe or lounge on the warm riverbanks. There is also a custom built education and conference center with facilities that accommodate up to 40 delegates for businesses, or groups that wish to hold corporate or team building functions at the park. The camp is set up on full board basis, apart from drinks, which visitors must pay for directly. However, there is a self-catering option available for guests who are seeking more independence during their stay at Liwonde. Aside from the standard game drives provided for guests in Liwonde, the highlight of a stay at Mvuu is a river safari. Handmade, but stable wooden boats provide transport guest down the Shire River on daytime and nighttime safaris and are the best way to experience herds of elephants or the Nile crocodiles that inhabit the river. On nighttime safaris, spotlights are used after dark to seek out some of the park’s unique birds, for example, the White-backed Night Heron and Pel’s Fishing Owl. Another highly recommended activity at Mvuu is a walking safari, accompanied by qualified scouts. Anyone looking to experience the most wildlife and bird life possible during their trip should not hesitate at the opportunity to explore Liwonde National Park by foot. Walking safaris give guests the chance to get up close to wildlife than other parks can generally provide on game drives, and can introduce tourists to wildlife that otherwise would be missed inside a vehicle. Apart from activities in the park, Wilderness Safaris also provide guests with the chance to learn more about Malawian culture with bike trips to local villages. Curious visitors can also opt to spend a night in a typical rural Malawian village, and learn more about the people and culture that otherwise would not be experienced in the park itself. It’s important to note that the activities available to guests at Mvuu are the same whether you choose to stay in the lodge or the camp. However, it is possible for guests staying at the Wilderness Lodge to make special arrangements with staff to combine sundowners or meal times with safari excursions. The Mvuu Wilderness Lodge and Camp is open year round, as is Liwonde National Park. However, during the rainy season, between February and April, many roads within the park are cut off due to flooding. During this time guests have to be boated into the lodge and camp in the same boats used for water safaris. The trip is 30 minutes long and the perfect safari opportunity for visitors who hope to see wildlife the minute they arrive at the park. While the rainy season is the perfect travel time for photographers and bird watchers alike, certain roads in the park are flooded, meaning that it may not be possible to take part in all of the activities offered by Wilderness Safaris. For visitors who hope to experience all the park has to offer it is best to visit during the dry season, which is from July until October. Luckily for bird watchers, due to the sheer volume of different bird species that live in Liwonde, visiting during the dry season does not mean you will miss out on seeing many of the specials that can be found in the park year round. Regarding health, no vaccinations are compulsory for a visit to Liwonde National Park. However, visitors are recommended to take malaria prophylactics during their stay. Make sure to speak to your health practitioner well before your trip to Malawi, as you may need to start taking this medication before you set out on your travels. Even though Mvuu Wilderness Lodge and Camp is the only onsite accommodation available when visiting Liwonde National Park, Wilderness Safaris continue to work their hardest to make your visit an unforgettable one. With all that the park has to offer regarding wildlife, birdlife, landscape, and activities, there’s no way that you will leave Malawi unsatisfied by what you’ve experienced. The exclusivity of a stay at Mvuu makes it one of the best and most memorable safari experiences to be found in southern Africa precisely for this reason. Want to see Mvuu as part of a trip? Enquire today to let us help build your holiday.